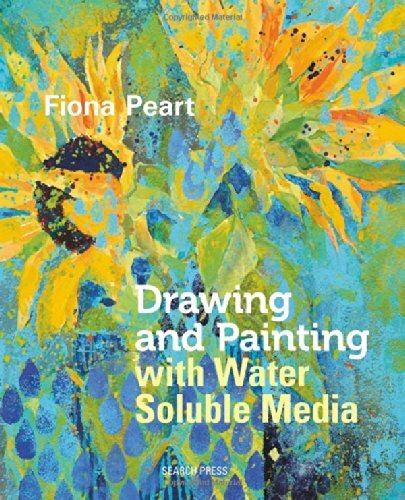 Drawing and Painting with Watersoluble Media is a book on exploring watersoluble media and what they can do. It's fun to see the different techniques demonstrated by author and artist Fiona Peart to create interesting effects. Many of the artworks look quite experimental to me. And many are actually considered mixed media pieces because the media don't really dissolve completely and you get a mix of dry and wet look. There are more experimental techniques like scraping pigment off coloured pencils or pastels and splattering them for texture. Some of the example artworks do work and look nice but others not so much. There's this particular piece with a cat that has what looks like blood coming out of the mouth. Then there's a step by step demonstration of a blue ewe painting that did not turn out looking quite right. I would recommend check out the author's websites for more examples or flipping through the book before buying. The featured artworks in the book are quite different from what I had expected, but that could just be my preference. The book does offer interesting ways to work with watersoluble media. Interestingly, all the drawing media are from Derwent brand, e.g. Aquatone, Artbar, Inktense, Graphitint, etc.